Logan Morisson was injured for parts of the last two seasons with the Marlins. One day after signing a new first baseman, the Marlins have traded Logan Morrison to the Mariners for right-handed reliever Carter Capps, FOX Sports baseball insider Ken Rosenthal has confirmed. Morrison, who missed the first two months of the 2013 season as he recovered from a second knee surgery in less than two years, hit .282 with four home runs and 11 RBI in 24 first-half games. But he tailed off with a .226, two homers and 25 RBI clip in the final 61. It marked his return to first base from the outfield, where he had played since his call-up in 2010. That season, Morrison posted a .283 average with two home runs and 18 RBI before battling injuries. Following a career year in 2011 — 23 homers and 72 RBI over 123 games — the 26-year-old has played in just 178 games the past two seasons, hampered by knee problems that led to the two surgeries. 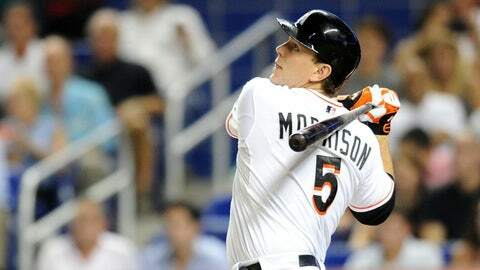 Morrison’s 2012 ended early to undergo a second procedure on his knee after batting .230 with 11 home runs and 35 RBI. He missed the first two months of 2013 recovering, ultimately hitting .242 with six homers and 36 RBI in 85 games. Miami signed first baseman Garrett Jones to a two-year, $7.75 million deal Tuesday. Earlier in the offseason the Marlins pursued Cuban free agent Jose Abreu. Last week, the Marlins signed a pair of veterans: catcher Jarrod Saltalamacchia and infielder Rafael Furcal. Capps fills a hole left in the bullpen after the departures of Chad Qualls (Astros) and Ryan Webb (Orioles). The 23-year-old right-hander went 3-3 with a 5.49 ERA in 53 games for Seattle. He surrendered 12 home runs in 59 frames, striking out 66 and walking 23. In his first season in 2012, he pitched 25 innings and posted no record with a 3.96 ERA. "It’s one of those areas that we’re working on," Marlins manager Mike Redmond said during a press conference Wednesday. "We lost Webby and we lost Chad Qualls, two guys that did eat up a lot of innings for us last year. We feel like we’ve got pitching depth in our organization, guys who can fill that role. "But as a manager, every team out here is looking for the same thing — everybody wants a bat, a couple bats, a couple pitchers or a couple relievers. Like any organization, we’re all looking for the same thing — trying to strengthen a bullpen and grab an offensive player or two to help us." Andrew Astleford contributed to this report.